Love it or hate it, Tabasco Sauce has been a fixture on kitchen spice racks, bartender's toolkits, and kitchen tables across the country for a century and a half now, helping to heighten the flavor of everything from eggs to Bloody Marys. 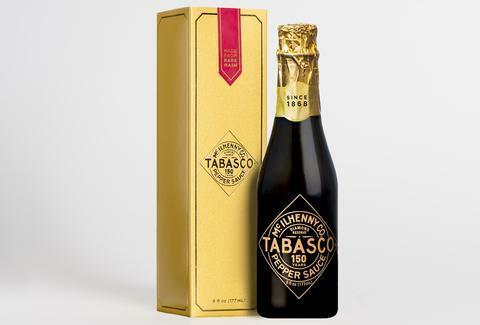 To celebrate the big milestone, the company that makes the typically petite bottles of spicy pepper juice is releasing a special 150th anniversary edition of Tabasco that comes in a champagne-style bottle. The sesquicentennial version of the beloved condiment, Tabasco Diamond Reserve Sauce, not only comes in a fancy boxed bottle, but is also produced in small batches available in very limited quantities. And while it may not be the hottest hot sauce the brand has ever produced, it's still made from select peppers sourced straight from the fields on Avery Island, Louisiana. Specifically, the peppers are "chosen for their superior color, texture, and robustness" then mashed with salt and aged for up to 15 years before being blended with sparkling white wine vinegar. The resulting "premium" version of the storied sauce is meant to capture the signature flavor of the traditional stuff while evoking "exceptional complexity." Needless to say, Tabasco fans are going to love it. "We have reached this milestone anniversary thanks to our devoted fans who have championed Tabasco Sauce in kitchens and at dining tables, in restaurants and in handbags, and from Avery Island, Louisiana to every corner of the world,” said Tony Simmons, president and CEO of Tabasco producer McIlhenny Company, in a press release. To get your hands on a six-ounce bottle, you can order one directly while supplies last on Tabasco.com, where they're currently selling for $34.95 a pop.